Arena Americas was honored to receive the 2018 Special Events Gala Award for Best Achievement in Event Rental Support at the Special Event Conference in New Orleans on February 1, 2018. The award was for Arena Americas’ support with the supply of clear span tenting, flooring, carpet, and other special event services for the 2017, 99th PGA Championship at Quail Hollow, Charlotte, NC. 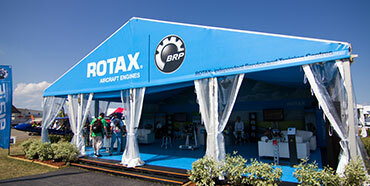 The temporary structures were used for corporate hospitality, merchandise, sponsors, media, concessions, admissions, and security. Single and double decker structures included glass walls, single and double glass door systems, carpet, and furniture designed to maximize guest comfort and event experience. “At our core is the principle of continuous improvement, working in concert with our partner, the PGA of America. Together, with the mutual focus on the best possible guest experience, our teams worked to design and deliver an amazing temporary infrastructure system throughout the golf course, which involved over 200 tractor trailer loads of equipment, and at times as many as 95 crew and staff working alongside the PGA of America team. We were honored to accept this award on behalf of our valued partnership with the PGA of America and our strong commitment to the golf and sports industry,” said Arena Americas CEO Paul Bryant. “Our Arena team expertly installed over 600,000 sq. ft. of flooring and subsurface, and more than 500,000 sq. ft. of clear span and support tenting for this event. The award celebrates both the relationship with the PGA of America, but also the expertise, knowledge, and commitment of all our Arena Americas team, from design, logistics and implementation, to actual installation and removal. Our team demonstrated our respect of the event, the client, and the site, all components that are part of the global Arena Standard,” said Matt Holt, VP of Commercial Operations. Headquartered in Oak Creek, Wisconsin, Arena Americas is the North American division of the Arena Group, whose global offices are in the United Kingdom. The Arena Group supplies special event equipment and services, ranging from clear span tenting, stadium seating, scaffold, and bleacher systems, HVAC, event flooring, tabletop services, interior décor services, and ice rink equipment and operations, from 14 locations in 7 countries around the globe.